The World’s Smallest Deer Is The? When it comes to tiny (and dare we say adorable) deer-like creatures, there are more than a few species to pick from—like the diminutive dik-dik found in the bushlands of eastern and southern Africa, or the Philippine mouse-deer found on certain islands in the Philippines. The only problem with the two aforementioned creatures, however, is that no matter how small and deer-like they look, they aren’t deer—both species, despite the name of the latter, are in different mammal families altogether, Bovidae and Tragulidae, respectively. 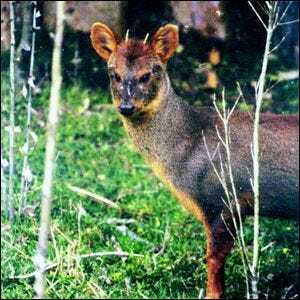 The title of smallest deer then, for a species belonging to the actual deer family (Cervidae), goes to the pudús of South America. Divided into two closely related species, the northern and southern pudú, the northern species is slightly smaller than the southern one, ultimately winning the title by mere inches. Northern pudús are so small that at 7.3 to 13.2 pounds, they barely weigh more than many newborn white-tailed deer (the most common species in North America), and the largest male pudús (southern species at around 30 pounds) would be outpaced by a white-tailed deer fawn in a matter of months. In fact, the only reason the above pudú looks like anything even remotely resembling the tall and majestic deer most people are used to seeing is because it’s standing next to tiny saplings. In reality, the pudú’s ears would barely reach past your knee. Image courtesy of Rodrigo Fernández.